What is there to say about sweet potato fries except that they are, quite possibly, the world’s most perfect food? If you have had good ones in your life, well, then, I think you agree with me. It took me far too long to appreciate the magic of (baked) sweet potato fries, and now I’d like to think I am making up for lost time. At least that’s how we’re going to play it because the truth (I’m a sweet potato fry addict and I can’t stop anytime I want, but why would I want to anyway) is far less becoming. I don’t know if I never had a sweet potato fry until college, or if I never had a good sweet potato fry until college, but in either case, college ruined me. They were, of course, fried, and also possibly lightly breaded but who cared because at age 20 your body is all like “2 bagels with full fat cream cheese and a side of lightly-breaded-and-deep-fried sweet potato fries for lunch? BRING IT.” Oh, and then, for dessert, we’d have one of these locally-made cookies that had – I kid you not – nearly an entire stick of butter in each one. But I digress. Baked sweet potato fries aren’t really the sacrifice that they sound like, provided they are cooked well and seasoned properly. Instead of the old, nasty frying oil, these are baked in good quality, heart healthy olive oil and seasoned simply with salt and, if you want it, pepper. Use salt. Use a lot of salt, in fact, because the starchy sweetness of the potato comes off as flat and bland otherwise. Of course, when you’re using a mere 3-4 ingredients, quality counts for a lot. Use a firm potato, the best quality oil you have, and …well you can use table salt. But if you opt to include pepper, freshly ground is preferred. As for cooking, all you have to do is lay the potato spears on a baking sheet, put it in the oven and walk away. But like the ingredients, so few steps mean that each one has to be done with care. 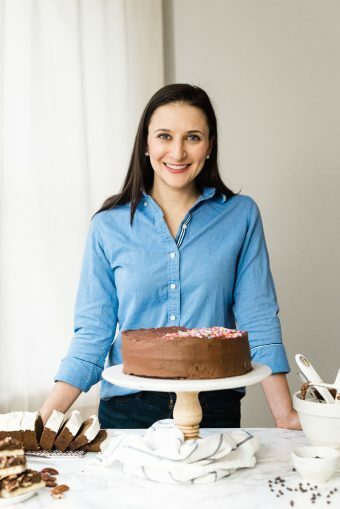 Use a nonstick pad (or parchment or spray) on the baking sheet, and be careful about arranging the potato spears so that they are not crowded together or touching. You can double or triple this recipe very easily, but be careful of overcrowding your baking sheets. If you have too many potato spears on a sheet, air can’t circulate and the potatoes end up steaming instead of crisping. Oh, the humanity. Also, watch them carefully. There is a fine line between cooked enough and overcooked with these fries, and they may not look done on top when they are, in fact, perfect. The trick is in the color of the underside of the fries; that is, the side touching the pan. 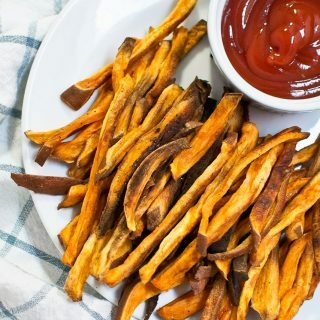 The recipe doesn’t call for you to flip the fries halfway through baking (although you certainly can if you want to), so most of the browning takes place on the underside of the fries, while the tops stay orange. When they are done, the underside will be perfectly browned, and if you wait for the top to follow suit, the fries will just burn. And no body likes burned fries. But I am making this too complicated. The reality of this recipe is: slice, toss, bake. It really is that simple! 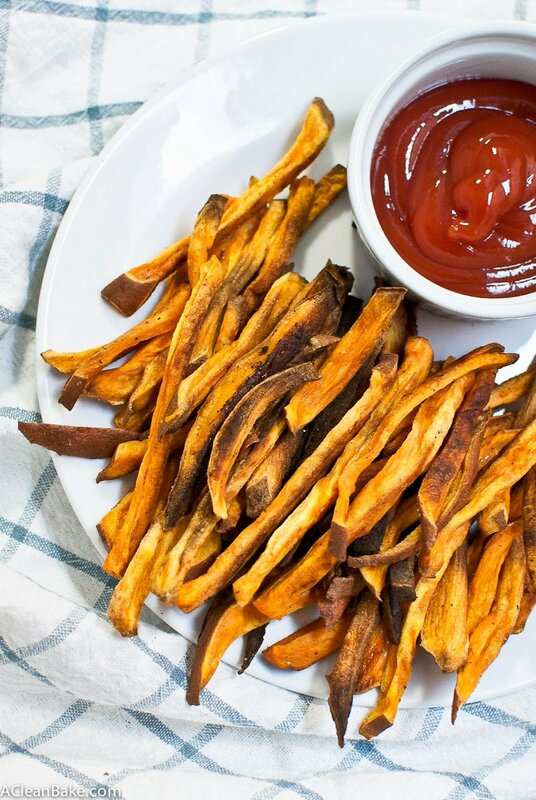 These thin sweet potato fires are just as crispy as you'd expect them to be - but they're baked, not fried! Preheat the oven to 375. Cover a large cookie sheet or baking dish with a nonstick pad or parchment paper, or spray it with nonstick spray. Set aside. Cut off the nubby ends of the sweet potato and discard. Slice the potato in half lengthwise, and slice into spears. Try to keep the pieces as uniform in size and thickness as possible. In a large mixing bowl, toss potato slices with olive oil and salt, pepper and chili powder (if using). Make sure each potato slice is evenly coated with oil and evenly seasoned. Transfer potatoes to prepared baking sheet or dish and arrange so that there is a bit of space between each and none are touching. This allows each fry to get crispy. Bake for 35-45 minutes or until the undersides are light brown. You can feel free to flip the fries at the 30-minute mark, but I usually don't bother. Cool on the baking sheet for 15-30 minutes before serving. This will allow them to crisp up.